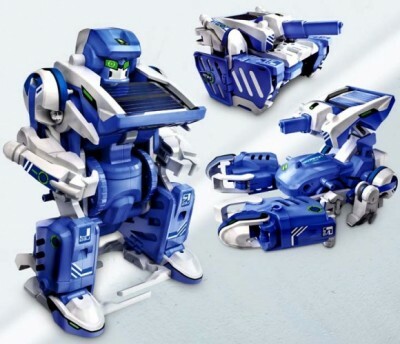 The T3 Solar Robot Kit is an educational (or desk) toy that consists of 70 pieces that can be arranged to make 3 different solar powered moving toys, a ‘standard’ robot, a tank and a scorpion. The T3 Solar Robot Kit can be used to help educate children about solar power. By constructing the 3 different models themselves, the child should feel more of a connection to the toy, which can allow them to take greater interest in the model when it moves in sunlight. Through watching any of these models once constructed they will witness an effective demonstration of how the power of the sun can be harnessed by the solar panel and converted into electrical energy. The models will also function under a deck light, if there is no sunlight to use. Once exposed to a light source each model will move itself across a flat surface. The robot kit comprises of all the parts and mechanics needed to construct the 3 models, the 70 pieces can be rearranged to form the ‘standard’ robot, the tank or the scorpion. A screwdriver will be required during construction. 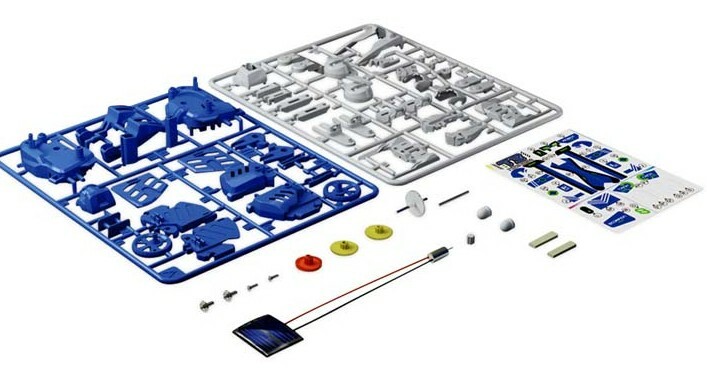 Due to the detailed instructions supplied with the robot and the simplicity of constructing the models, the kit is suitable for ages 8 and up. The T3 Solar Robot Kit is both an interesting desk toy and a great educational toy for children. The robot is designed to be suitable as a first time science project to help teach children about alternative forms of energy, though some adult supervision is recommended.